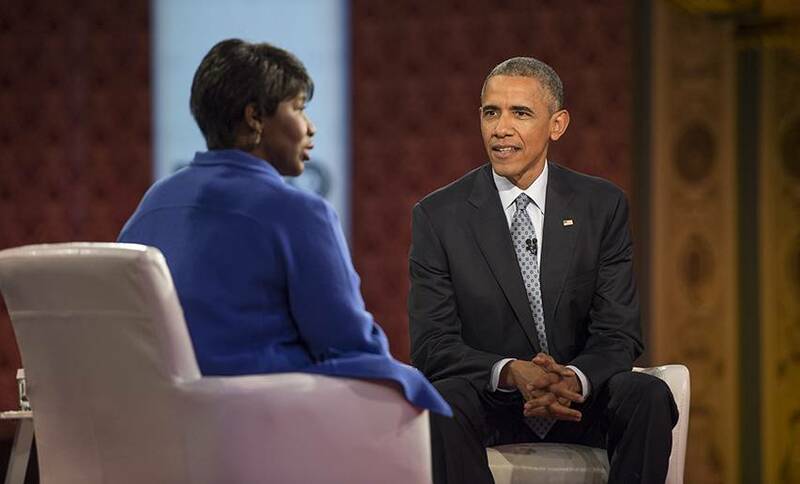 PBS NewsHour co-anchor and managing editor Gwen Ifill will sit down for an exclusive interview with President Barack Obama on Wednesday, June 1 in Elkhart, Indiana. It will follow with a town hall, produced by PBS NewsHour, during which local residents will ask questions of the President. The one hour primetime special will air at 8pm EDT on PBS stations across the country. An excerpt will air earlier that evening on the PBS NewsHour. “Questions for President Obama: A PBS NewsHour Special”​ will explore a variety of topics raised by the Elkhart residents. Ifill is also the moderator and managing editor of PBS' Washington Week. In February 2016, with co-anchor Judy Woodruff, Ifill co-moderated the PBS NewsHour Democratic Primary Debate between Hillary Clinton and Bernie Sanders. During the 2004 and 2008 Presidential elections Ifill also moderated Vice Presidential debates. Ifill has covered eight Presidential campaigns, and during the 2008 campaign season, she won the George Foster Peabody Award after bringing Washington Week to live audiences around the country as part of a 10-city tour. Media inquiries can be directed to Nick Massella, PBS NewsHour’s director of audience engagement and communications atnmassella@newshour.org. PBS NewsHour is seen by over four million weekly viewers and is also available online, via public radio in select markets, and via podcast. PBS NewsHour is a production of NewsHour Productions LLC, a wholly-owned non-profit subsidiary of WETA Washington, D.C., in association with WNET in New York. Major funding for PBS NewsHour is provided by the Corporation for Public Broadcasting, PBS and public television viewers. Major corporate funding is provided by BNSF, Lincoln Financial Group, Fathom, and Genentech with additional support from Alfred P. Sloan Foundation, Carnegie Corporation of New York, the J. Paul Getty Trust, the S.D. Bechtel, Jr. Foundation, the John D. and Catherine T. MacArthur Foundation, the Lemelson Foundation, National Science Foundation, The Rockefeller Foundation, the William and Flora Hewlett Foundation, Ford Foundation, Skoll Foundation, Friends of the NewsHour and others. More information on PBS NewsHour is available at www.pbs.org/newshour. On social media, visit NewsHour on Facebook or follow @NewsHour on Twitter. WETA is one of the largest producing stations of new content for public television in the United States and serves Virginia, Maryland and the District of Columbia with educational initiatives and with high-quality programming on four digital television channels. WETA productions and co-productions include PBS NewsHour, Washington Week with Gwen Ifill, America After Charleston, The Kennedy Center Mark Twain Prize, The Library of Congress Gershwin Prize for Popular Song and documentaries by filmmaker Ken Burns. PBS, with 350 member stations, offers all Americans the opportunity to explore new ideas and new worlds through television and online content. Each month, PBS reaches nearly 109 million people through television and more than 28 million people online, inviting them to experience the worlds of science, history, nature and public affairs; to hear diverse viewpoints; and to take front row seats to world-class drama and performances. PBS’ broad array of programs has been consistently honored by the industry’s most coveted award competitions. Teachers of children from pre-K through 12th grade turn to PBS for digital content and services that help bring classroom lessons to life. PBS’ premier children’s TV programming and its website, pbskids.org, are parents’ and teachers’ most trusted partners in inspiring and nurturing curiosity and love of learning in children. More information about PBS is available at www.pbs.org, one of the leading dot-org websites on the Internet, or by following PBS on Twitter, Facebook or through our apps for mobile devices. Specific program information and updates for press are available at pbs.org/pressroom or by following PBS Pressroom on Twitter.